The Grateful Dead formed from elements of San Francisco's burgeoning underground music scene in the early 60's. Guitarist Jerry Garcia had served a stint as a folk and jug band performer; keyboardist Ron "Pigpen" McKernan, rhythm guitarist Bob Weir and drummer Bill Kreutzmann hailed from various rock and R&B club bands; bassist Phil Lesh was a composer of electonic music. With a sound described as "rolling thunder," the Grateful Dead quickly became favorites on the Bay Area's psychedelic ballroom circuit. In 1967 the band signed to Warner Bors. Records. Their self-titled album was recorded in three days and mixed in one. Produced by Dave Hassinger (who also worked with the Rolling Stones) The Grateful Dead highlighted the band's best in-concert material, including their first single "The Golden Road (To Unlimited Devotion)." Other standouts on the LP include Pigpen's signature blues tune, "Good Morning, Little School Girl," the poignant anti-war ballad "Morning Dew," and the pop-flavored "Cold Rain & Snow" and "Cream Puff War." The album's centerpiece is the mammoth "Viola Lee Blues," clocking in at 10:01. The cut, built around a blues standard, showcases the interplay that proclaimed The Grateful Dead one of the best improvisational groups in rock history. 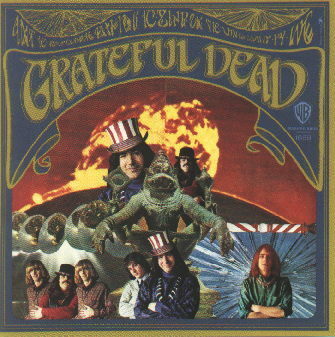 This album was released on March 17, 1967 and is the first commercial album for the Grateful Dead. It was originally titled The Golden Road.